This is very much American Chinese food, not authentic Chinese. My mom made this for us a lot when I was growing up and once I started cooking I added it to my repetiore. It's so easy to put together and comes together quite quickly. I'm always amazed that it tastes as good as it does. Pair it up with some egg rolls and you've got yourself dinner. Heat oil in a large frying pan or wok over medium heat. Add onion and green pepper and cook until veggies soften a little. Turn up the heat to med-high. Add the chicken and bean sprouts - mix altogether. Add chow mein noodles and chicken stock. (Keep extra water on hand just in case the noodles start to stick a little). Dash with soy sauce to your liking. Mix together. Keep cooking and stirring until the noodles are soft. Serve. *You can add other ingredients to this one. I've used mushrooms, water chestnuts, snow peas, and celery at times, depending what I have on hand. A great quickie! Looks very tasty indeed. delish! i love food like this, it looks SOOOO good! AmericanChinese or not, this looks good to me! Chicken chow mein is a fav of my hubbys. I have yet to try an at home version. Sounds easy and perfectly delicious. 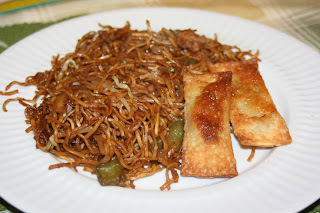 I don't think my kids have ever had chow mein before, but my mom used to make it all the time for me. I'll have to give this a try! Oh does this ever look good! I love chicken chow mein and am glad that now I can make it homemade! Looks good! Love (American) Chinese food and so do the kids. Kristen! Hope all is well!